Some of us are heading into winter while others are heading into summer. We’ve pulled together a few celebrity style looks to inspire your next sewing project, no matter what season it is! You’ll find links to our sewing patterns below to help you complete the look. 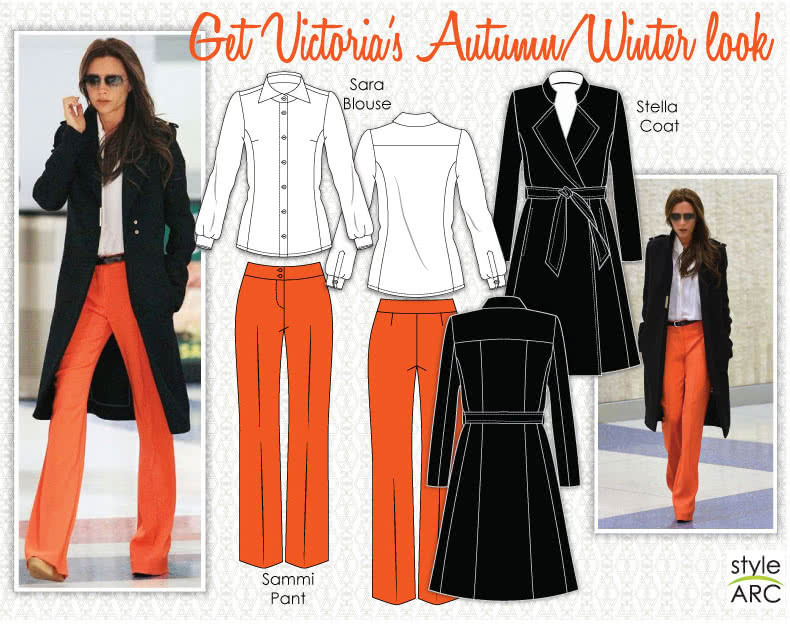 Get Victoria’s Autumn Look with Style Arc’s Sammi Woven Pant, Stella Coat & Sara Blouse. We love Victoria’s chic celebrity style. Her uncomplicated yet sophisticated styling makes her stand out from the crowd! To brighten up a winter wardrobe choose a bright colour for a pant, a classic white shirt and then team it with the timeless Stella coat. Sammi Woven Pant: slight boot cut, classic fly front shaped waistband, woven fabric. Stella Coat: Classic styling, knee length, tie belt, wrap front, stand collar, optional fully lined, woven fabric. Sara Blouse: Front princess lines, back darts, long sleeve, traditional shirt, woven fabric. Poppy mixes it up with with a casual pant and classic jacket. We love that she has chosen a print for her pant and teamed it with a soft blouse. The look is finished nicely with a classic Chanel inspired jacket. Coco Jacket: Faux pockets, Chanel inspiration. Tiffany Blouse: Long sleeve, princess line, tie neck, soft blouse, woven fabric. Wallis Pant: Crop narrow leg, side zip, fitted woven fabric, hem split, waistband. Taylor looks cool in this playful printed sun dress. For cooler evenings throw on a classic denim jacket. Anthea Dress: Round neck, waisted, a-line skirt, back zip, sleeveless, optional fully woven fabric. Stacie Jean Jacket: Classic denim jacket, woven fabric, long sleeve.